Dr. B Vishnu Vardhan is a qualified Teaching professional with more than 21 years of experience in Technical education and has completed his M. Tech from Birla Institute of Technology, Mesra, Ranchi in the year 2001 and completed his Ph.D from JNTUH in the year 2008. He is having good Administrative exposure in conventional education system and is presently working as Vice Principal and Professor of CSE at JNTUH College of Engineering Manthani, Karim Nagar.Headed Department of IT of JNTUH CE Nachupally during 2010 to 2014. In various capacities he was involved in many state level common entrance tests and is a member of various professional bodies like CSI, ISTE & IEEE. His experience in diversified and integrated research exposure in the area of Computer Science and Information Technology has paved a way in guiding many Research scholars in the elite fields of Engineering.Under his guidance 6 scholars were awarded Ph.Ds and another 8 scholar's research work is in progress. His areas of interests are Linguistic processing, Data mining, Natural language processing, Information security and Machine Learning . Professor Vishnu vardhan is an Effective researcher with an ability to review and select new technologies with focus on qualitative and quantitative elements. He is the recipient of “Research Excellence Award” by Indus Foundation at Indo global Education Summit 2017, Published more than 70 papers in various International Journals and Conferences. Some of the top Journals that he published his articles are " ACM transactions, Taylor and Fransis, WSEAS transactions,Inderscience, Springer,Elsevier and IEEE. Out of the published papers,more than 30 papers were indexed in SCOPUS and 5 papers were indexed in SCI. He has visited Singapore and presented a paper in an International Conference, ICAEE in 2014. He has completed a project funded by Government of AP worth 5 lakhs from Ministry of IT on localization activity and as a co investigator completed another UGC funded project worth 9 lakhs. He has an extensive participation in research and academic activities like paper publications, conducting seminars/ workshops/ symposiums. His Continuous participation in community development made him involved in Free Software Movement in the academic circle in Hyderabad.He is an acting Chairman, Board of Studies for Computer Science Department for Sathavahana University. Acted as a BOS (Board of Studies) member for JNTUH, JNTUK. 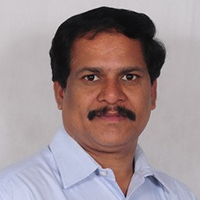 He is an editorial and technical board member for many International Conferences, Reviewer for many International Journals like CSC Jounals, IET Jounal and IJIEE and evaluated a number of thesis from various Universities like Osmania, JNTUK and Nagarjuna University. Member, Board of Studies for JNTUH and JNTUK during 2015-2016. Involved in implementing CBCS in JNTUH and JNTUK during 2015-16. Chairman Board Of Studies for Computer Science at Satavahana University Karimnagar from the academic year 2014-2016. And acted as a member during 2012-2014. Technical board member in International Conference on Advances in Electronics Engineering, ICAEE 2015, South korea. Technical board member for Third International Conference on Signal, Image Processing and Pattern Recognition ( SPPR 2014 )Chennai. Editorial and Technical board member for International Conference of Managing Information Technology (CMIT-2014)Zurich, Switzerland. Chaired a session in “National Conference on Computing Communication and Instrumentation (NCCCI-2012) on 22nd December 2012 at Gitam School of Technology, Gitam University Hyderabad. Chaired a session in the track Computer Science Engineering in “National Conference on Information Systems and Knowledge Engineering (ISKE-2013) on 19th July 2013 at Mallareddy Engineering College, Hyderabad. Chaired a session in the track Computer Science Engineering in “International Conference on Advanced Computing Methodologies” (ICACM 2013) on 3rd August 2013 at Gokaraju Rangaraju Institute of Engineering and Technology, Hyderabad. Chaired a session in the track Computer Science Engineering in a Two day “National Conference on Advances in and Networking” (NCACN 2013) on 7th December 2013 at JNTUH College of Engineering Manthani. Chaired a Session in International Conference on Emerging ICT for Bridging Future during 12-14 December 2014 conducted by CSI Hyderabad Chapter in collaboration with JNTUH and DRDO. Chaired a session in the track Computer Science Engineering in a Two day National Conference on “Advanced Computing and Pattern Recognition” (ACPR 2014) during 8th and 9th January 2014 at JNTUHCEJ. Chaired a session in the track Computer Science Engineering in a Two day National Conference on Recent Trends in Science and Technology (NCRTST 2015) during 25-26 February 2015 at JNTUHCEJ. Chaired a session in the track Computer Science Engineering in “IEEE 6th International Conference on Advanced Computing 2016, at SRKR Engineering College, Bhimavaram during 27-28 February 2016. Chaired a session in the track Information Retrieval Systems in “1st International Conference on Computational Intelligence and Informatics( ICCII 2016), at JNTUH College of Engineering , Hyderabad during 28-30 May 2016. Delivered a Invited Speech on “Machine Learning” in a Two day National workshop on “Research Methodologies in Machine Learning” on 21st December 2012 at Srinidhi Institute of science and Technology SNIST, Hyderabad. Delivered a Keynote Speech on “Emerging Technologies in Academics & Research Domain” in a Two day National Conference on “Advanced Computing and Pattern Recognition” (ACPR 2014) 0n 8th January 2014 at JNTUHCEJ. Delivered a Keynote Speech on “Programming the semantic web” in a One day National workshop on 8th November 2014 at Gitam University Hyderabad.